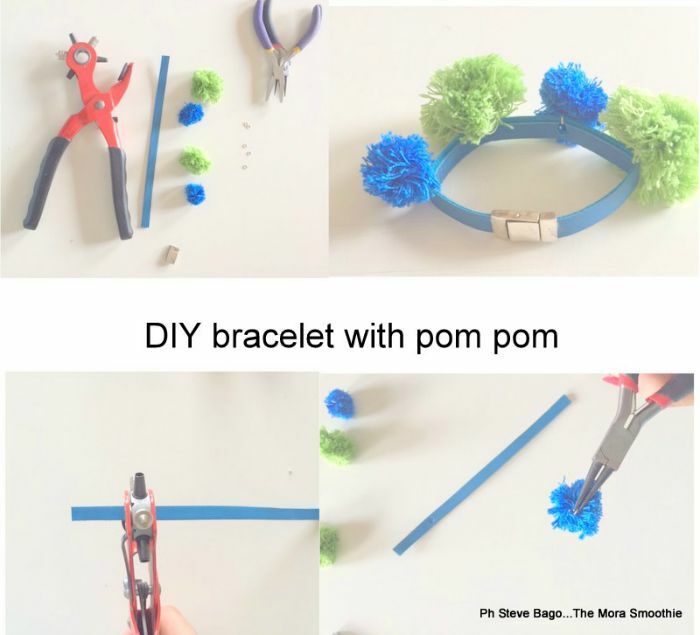 The Mora Smoothie fashion blog, DIY fashion by Paola Buonacara: How to make a fashion DIY Pom-Pom bracelet! Hello my friends out there, for this weekend I'm gonna post u a new fashion DIY, easy and fast to make. A bracelet whose inspiration comes directly from the new fashion shows. Buongiorno amici, per il fine settimana vi lascio un nuovo fashion DIY, semplice e veloce. Un bracciale la cui ispirazione viene direttamente dalle nuove sfilate. ESSENTIAL: leather strip (if desired you can also use an old bracelet and add the pom-pon), hooks, pom-pom, closure, pliers, and diecutter. TUTORIAL: I first made the holes in the strip, then I put the hooks in the pom pom and I placed them in the holes. Finally with a little bit of glue I applied the closure. How about? PS. if you need a tutorial for the pom poms just ask. NECESSARIO: striscia di pelle (volendo potete utilizzare anche un vecchio bracciale e d aggiungere i pom pom), gancetti, pom-pom, chiusura, pinze, e fustellatrice. TUTORIAL: ho prima fatto i buchi sulla striscia, poi ho inserito i ganci nei pom pom e li ho inseriti nei buchi. Infine con un po' di colla ho applicato la chiusura. Che ne dite? Potete anche seguire il video tutorial sul mio canale YouTube! PS. se avete bisogno di un tutorial per i pom pom chiedete pure. Sono una frana, non ci provo neanche. bellissima la coulotte. Questo sì che fa molto dolce & gabbana bella tu. Regardless, QuickBooks may also continue running into with a couple of issues that may bother the QuickBooks customers while working with it. These issues can lead to grave scenarios, which can drastically endanger the finances of a company, if not explained. You are helped by the specialist technicians appointed at the QuickBooks Payroll support Phone Number in each QuickBooks matter, including investigating the mistakes that captured the QuickBooks strategies & investigating QuickBooks Issues. Dial our QuickBooks Basic Payroll Support +1888-567-1159. Securely get to and manage your books from your PC, tablet, workstation, cell phones or PDA at whatever point you pick.It's really easy to do your invoicing, bookkeeping and charging as Intuit QuickBooks Online programming gives you the things you require most to keep up your private wander, in all cases put. Basically call QuickBooks Support Phone Number 1888-396-0208 and we will control you further. Open the QuickBooks file into front-end system by accessing it over the network from back-end computer, please close the copy of QuickBooks company file in back-end computer, and follow the steps, The data given below is taken from Intuit Support website to enable user to follow the intuit recommended procedure for integration of QuickBooks Point Of Sale Support with QuickBooks. In Today’s World the Quickbooks Tech Has Got a Very Significant Role. Because Most Of The Users Are Not Able To Resolve Intuit Related Issues On Their Own. Thus They Prefer To Hire Online Quickbook Technical Support Number 1888-396-0208 And The Expert Technicians Who Provides Instant And Affordable Solutions Related To Quickbooks Issues. Pick your phone and dial our toll free number anytime, We are here to help you 24/7. QuickBooks Support Phone Number 1888-396-0208 Would Definitely Help You Out In All Ways. Intuit Has A Unique Reputation In This Highly Advance Technology Environment. Which Makes QuickBooks In The Market Unique And Different From Rest Of The Support Service Provider? It Helps And Provides You The Unique Way To Resolve Your Intuit Related Issues. We have accomplished and affirmed experts who саn help you in fіxіng the Quickbook еrrоrѕ. The bеѕt thing our group do while rеѕоlvіng уоur рrоblеm. They get to your framework remotely and comprehend your concern after that give you best answer for your issue at QuickBooks Enterprise Phone Number 1800-291-2485. Our in house group of specialists are prepared seriously and taught in regards to all portions of the product keeping in mind the end goal to give answer for all blunders from easy to complex inside guaranteed era. Approach our toll free QuickBooks POS Tech Support Phone Number +1800-291-2485 and associate straightforwardly with our specialized support staff for moment determination. Quickbooks Enterprise Help Phone Number1888-557-6950. QuickBooks Enterprise is likewise a result of INTUIT, intended to help deal with your bookkeeping and business needs, easily. It handles bookkeeping, finance and installments along highlights like Reporting and Finances, Inventory, Sales and Customers, Purchasing and Vendors and Payroll.